I’ve been busy for weeks with pre-trip madness, but on Tuesday I got a sudden, sad reminder of how fragile and precious life is. Lisa, the blogger behind La Mia Cucina and one of the founders of the Daring Bakers, unexpectedly passed away, leaving behind a community of baking bloggers that she helped create. I can’t believe I’ve been blogging long enough to reminisce about the good old days, but here I am. When I started my blog over seven years ago, there was no Facebook, or Twitter, or Instagram. Finding other blogs was a matter of looking through search engine results, or poring through someone else’s blogroll, or just being lucky enough to get a comment on your page from a like-minded blogger. As bloggers started to connect and band together, the Daring Bakers emerged as one of the most fun groups for the baking-obsessed. Although it started out small, Lisa and Ivonne graciously allowed anyone interested to join – eventually membership grew so large they were able to launch a separate website, The Daring Kitchen. Ask any Daring Baker and the memories are plentiful, and close. The anticipation as the recipe of the month was about to be revealed. The happy brainstorming among members of how they would make the recipe. The sharing of questions, frustrations and most importantly encouragement. The mad dash to finish and post before the midnight deadline. One of my favorite memories was posting day, when everyone tried to go around to everyone else’s blogs to ooh and aah over the results and leave comments. Over time, as the number of Daring Bakers soared into the hundreds, it became too hard to visit each and every page. But while I was still able to do it, I cherished this sense of camaraderie: we’d all pulled together and made the same thing, together! I think that was the most wonderful legacy that Lisa and Ivonne created. In a time when bloggers were still trying to reach out and figure out what this whole blogging thing was about, they helped form one of the best communities on the internet. As more and more Daring Baker alumni learned about Lisa’s passing on Tuesday, comments like, “I can’t believe it was so long ago!” or “Seeing all these names brings back so many memories,” kept popping up. I felt the same – I can remember so many Daring Bakers events like it was yesterday, that I’m surprised there are so many other days that have snuck in between. Many of my dearest food blogging friendships were started in Daring Bakers. Although many of us eventually left the group to pursue other interests, the friendships remained. Fellow Daring Baker Kelly kindly pulled together as much of the Daring Bakers as she could and organized a tribute event for today, Friday, to remember Lis, the queen of all the Daring Bakers. Some of us will be making some of the Daring Bakers recipes to honor her kindness, sense of humor and her life. Unfortunately, I’m away from my kitchen – I left for a long-awaited trip to Hong Kong on Thursday. So while I can’t turn on my oven for Lisa, I’ll repost my favorite challenge from my time in the Daring Bakers. This was one of the first challenges I did for Daring Bakers, a chocolate and caramel tart from Eric Kayser’s Sweet and Savory Tarts. I remember being so excited because French tarts were on my list of pastries to master, and I had just gotten this book and was thrilled that the hostesses had picked a recipe from it. I still remember making this in my tiny apartment in San Francisco, and trying to get the caramel shards to come out right – there was a lot of talk amongst the Daring Bakers who were attempting to work with caramel for the first time! I miss the days of the Daring Bakers, and I’ll miss Lisa dearly – without her organization and encouragement, we wouldn’t have had this wonderful monthly baking event, and we wouldn’t have formed such a close and lovely community. Here’s a spatula raised to the queen of all the Daring Bakers, Lisa. Sift flour, baking powder, and cocoa powder together in a bowl. Set aside. Place butter in bowl of stand mixer and cream with paddle attachment until smooth and creamy. Add confectioners' sugar, hazelnuts, and cinnamon. Beat to combine. Add in flour mixture, and beat just until incorporated. Turn out dough onto a piece of plastic wrap. Flatten into a rectangular block, wrap tightly, and refrigerate overnight. 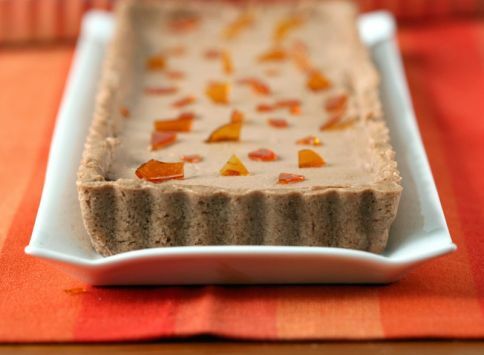 Preheat the oven to 325 degrees F. Set out a 9-in square or 10-in round baking pan, or 14-in x 4 1/2" rectangular tart tin. For one tart, you need 1/2 lb (250 g) of the crust dough. (You can wrap and freeze the remainder for up to a month). Roll it out to about 1/4" thick and carefully lay into the baking pan. Prick bottom all over with a fork. Bake for about 15 minutes. Take out of oven and set aside while you make the filling. Cook 1 cup (200 g) of the sugar in a medium heavy saucepan until it turns golden brown. Add cream and butter and mix to combine. Remove from heat and let cool. Beat eggs and egg yolk together in a large bowl. Add the flour and mix to combine. Add in the caramel mixture and mix to combine. Pour into tart shell and bake for 15 minutes. Remove and let cool. Beat cream in a mixer with whip attachment to stiff peaks. Melt milk chocolate in heatproof bowl set over saucepan of simmering water. Fold gently into the whipped cream until combined. 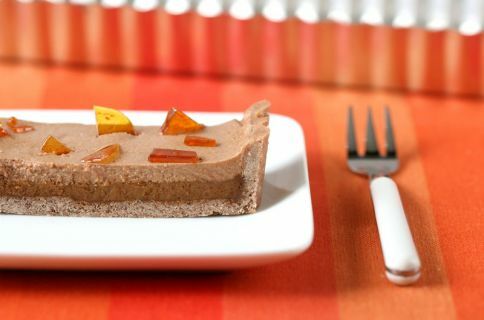 Pour chocolate mousse over the cooled caramel mixture and smooth with a spatula. Chill for an hour in refrigerator. To decorate, melt the remaining 1/2 cup (100 g) sugar from the caramel recipe in a saucepan until it turns amber. Pour onto waxed paper laid out on a flat surface. Let cool and break into small pieces. 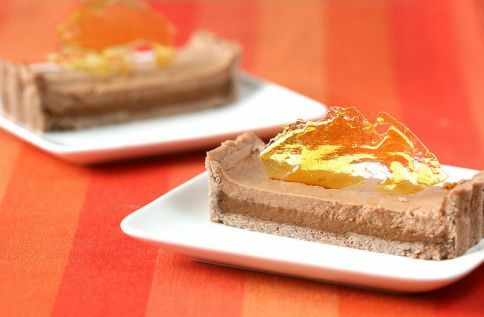 Arrange on top of chilled tart. Aww this is such a nice event, so such sad news. Big hugs to you and your group of amazing bloggers! What sad news. I’m a past member of the Daring Bakers too, adn this recipe was the first ever one I did after joining the group. It was a small group, and we all had a wonderful time baking together and making friends. I so enjoyed meeting you and some of the other DBs at the Food and Light Workshop in Boulder. Enjoy Hong Kong, I haven’t been there in years. The blogging community has lost a very special lady. We all learned so much with a sense of style, humility and humour,and ALWAYS laughter and fun. Some of us may no longer be Daring Bakers but we are still those fledgling bloggers in spirit who rose to every challenge at “dawns crack”. Thank you Lis. You certainly captured the feeling of the early Daring Bakers…it was a different time, but special. I loved this tart and your photo shows it to perfection. Thanks for the memories! Lis will be missed. G’day! Lovely tribute to a lovely person we were all blessed to be connected through! I would love to make this, especially because it reflects the best of the baking blogosphere, but I’m not sure what the crust is composed of here. Is there a recipe for the crust? Very strange – I had the tart crust in the recipe but it doesn’t appear to have shown up! I am on vacation right now and will add in the crust recipe when I return. Sorry and thanks for your understanding! I loooove chocolate and I love caramel. This recipe is definitely in my near future! I don’t see where the recipe for the crust was ever posted. Can you post this as I want to enter it into a contest for the Fourth of July? I’m so sorry – the crust recipe has been added to the recipe. I know it’s probably too late, but thanks for checking in and I hope you had a happy 4th!